Are you looking for information about ways to prevent apples from turning brown? 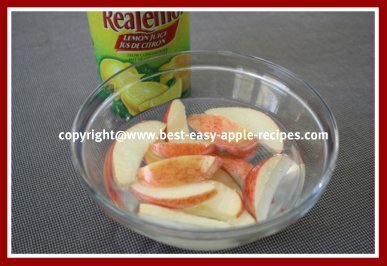 Do you want to include apple slices in a lunch, on a fruit tray with dip, or in a salad, but you are worried about the apple browning? Here are very simple tips to help prevent apples from turning brown. As a mother, I know that when you put an apple in a child's lunch, (or in an adult lunch:)), you often find that the apple is returned home at the end of the day, in the lunch container, untouched. I believe that the most common reason for not eating ones apple for lunch or for snack time, is the fact that, it is not always a desirable fruit to eat without having it sliced. But, how do you keep the apple slices from browning? One method is to purchase ascorbic acid (also known as Vitamin C), for example "Fruit Fresh" which helps prevent fruits and veggies from browning. The ascorbic acid is mixed with water and the fresh produce is tossed in the solution. I use "Fruit Fresh" on occasion and I find it works well. Ascorbic acid such as "Fruit Fresh" can be purchased in most grocery stores, or you can order it online at *Amazon.com (see below). A Second method is to use citrus juice use the following tips to help keep the apples looking fresh and appetizing so you can include them in the lunches, on fruit trays, and in salads! This method (below) will work well for peeled slices of apples, and for apple slices with the fruit skin not removed from the apple. The acid in the citrus juice helps to slow down the oxidation (reacting with air) process of the apples. Once treated with the citrus juice, the apple slices should be sealed in a plastic bag, plastic wrap, or a sealed container to help prevent the apple from reacting further with the air (oxidizing). Sprinkling the sliced apples with lemon, lime, pineapple, or orange juice, and then storing them in a sealed plastic bag, plastic wrap, or a sealed container in the refrigerator, or at room temperature for a few hours works great for the lunches! Instead of sprinkling the sliced apples with juice, you can soak the apple slices in a mixture of cold water and citrus juice. Use about 1/4 cup lemon juice to 1 quart of cold water. Briefly dip the apples in the water/citrus juice solution, and then remove them, and pat the apple slice dry before using. You can store this water/citrus juice mixture in the refrigerator for up to a week, adding apples to dip as needed. Experiment with different types of citrus juice. I prefer using lemon juice, but some people believe that the type of juice used has an impact on the flavour of the apple. Some people prefer to use an apple slicer and slice the apples without completely separating the apple at the bottom, leaving the peel on. By leaving a bit of the outer skin intact you can then cover the entire apple in plastic wrap (to keep the air out), and it will not turn brown in your lunch container. It is possible to purchase powder (ascorbic acid) to add to cold water and make a dipping solution to help prevent discoloration of the apple. 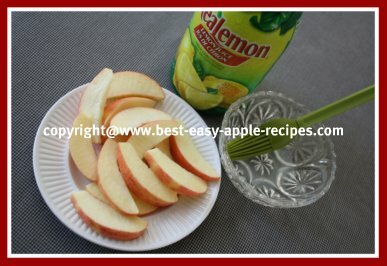 Instead of using citrus juice, you can use a mixture of lemon-lime soda and cold water for a dipping solution to help prevent browning of the apples. If possible, choose a variety of apple that is less prone to browning. Granny Smith, Golden Delicious and Cortland Apples are a few examples of apples which are known not to discolour as quickly as others. The Red Delicious Apple variety, for example, is a type of apple which turns brown very quickly after it is sliced/peeled.